Early in February, I volunteered to write a blog post for this month — Women in Youth Ministry Month. Since that day, I have started and restarted writing this post no less than 50 times. My topic? 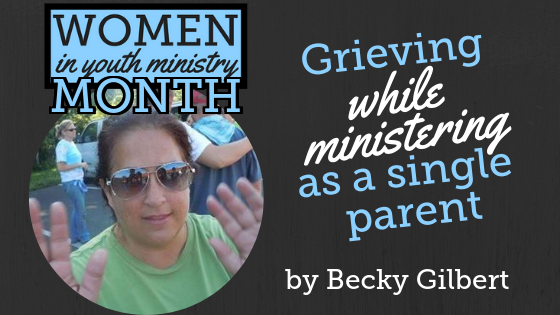 Grieving / navigating youth ministry as a single parent. Not exactly what I thought I would be writing about this time last year. In the last several months, I have found support in the Women in Youth Ministry Facebook group and while I know it is a safe space to speak freely, I still feel this incredible pressure to say something profound in this article that will right all the wrongs in the world and make my own personal tragedy seem like it serves a purpose. Can I be honest? Since losing my husband in August, I feel like I am on display. I feel like my kids are on display. “Hey church, look at these poor people, no husband, no father but they are still here!” Of course, no one actually says that – out loud. But every time a well- meaning friend or congregant says, “I can’t believe you are still doing ministry, I don’t know how you do it with three kids… you are AMAZING…” it makes me well, angry. I know, weird. I don’t really know if angry is the right word, as I am still processing so many things, but if it is not anger– it is definitely frustration. I serve on staff for a medium-size United Methodist Church as the Youth Pastor and Worship Leader. On my first Sunday back after taking some time, quite a few people seemed genuinely surprised to see me leading worship. But God’s call on my life into youth and worship ministry came long before I was married and had kids. I have struggled with my faith at various times throughout my life, hard times at the beginning of marriage trying to balance ministry and being newly-married. Miscarriages, loss of other family members. Youth who were following hard after Jesus, who one day decided that somehow Jesus had let them down and they would find their own way in life. After all of these circumstances, I had conversations with God- where are you? Why won’t you do something? Are you even there? Even after I have asked so many times, God is still there. The past 8 months have been excruciating at times – there are days I want to pack up the kids and move to the beach or the mountains or anywhere but here and never look back. There are days, like 2 Fridays ago, when we had a record high of 53 youth at youth group and the energy was so high and the Spirit was moving – 6 middle school boys decided to follow Jesus that night. There are days like Sunday, when we tried some interactive worship experiences, and people who never show any outward appreciation for worship participated! Eight months ago, my life changed drastically overnight. I now have to work a little harder to budget my time and money. I have worked harder to schedule when, where and how my kids get to school and practice and friend’s houses. I have to schedule Youth trips and figure out child care more thoughtfully. This is not “amazing,” as some people tell me, so many women do this every day and I have a new appreciation for how hard it is. I don’t know what that means for tomorrow, but for today it means that I am able to take care of my family and that my kids are able to have a front row seat to see what it means to continue to ‘work out our salvation with fear and trembling’ and to know that it is God who takes care of us and THAT, my friends IS AMAZING! ABOUT BECKY: Becky Gilbert, 20 plus year youth ministry veteran. Currently the youth Pastor at First UMC Homestead in Homestead, Florida. She loves everything about youth ministry! She has 3 kids; Hunter, Hudson and Harlowe.